The Athenian Polis traveled a crooked road in the hundred years before true democracy was achieved under Cleisthenes. The story and the dynamics at work in Athens during the sixth century B.C. are the subject of this article. Prior to the reforms of Solon, the Athenian political system was controlled by a group of aristocratic families – the Eupatridai or “well born ones”. Notice that “patri” (father) serves as the root of this word like it does in the Roman word patrician. In both cases we see a government managed by a group of families claiming legitimacy through longevity – a kind of original authority. The senior magistrates of Athens, the Archons, as members of the Eupatridai, controlled the machinery of government. After a year in office each Archon joined a group of elders called the Areopagos, which, among its several powers, controlled Athenian citizenship by determining who qualified to be members of the Phratries or kinship groups. Another source of power, held by the Eupatridai, was control over property. They managed most of the land in Attica by claiming authority over public land. The commons were hired as tenants to work this land and forced to pay one sixth of their crop value as rent. These issues of governmental power and land control were causing great dissatisfaction among the Athenian people at the beginning of the sixth century. The universal authority of the Eupatridai was opposed by a rising middle class (similar to the Equites of Rome) who had acquired wealth through their own hard work, but had no access to power. At the same time, tenants working the fields began to agitate for a re-distribution of land, so they could own property and take control of their lives. Enter Solon, the lawgiver, elected Archon in 594 B.C, who decided to remedy all injustices against the common people. Solon implemented a sweeping set of new laws designed to address the concerns of the disadvantaged, but not go so far as to upset the aristocratic class. He was truly walking a tightrope. With respect to the government, Solon organized citizens into four classes by wealth. The second class, Hippeis, included those of “new money” who were now allowed to run for Archon. He provided for all citizens to participate in the Ecclesia (assembly) and the lower classes to have their own court system (Heliaia). The Heliaia had to power to elect officials and indict them for crimes against the people. Solon is also said to have created the Council of 400 as a consultative body to the Ecclesia. Solon’s efforts in land reforms included what was labeled Seisachtheia, or shaking off of burdens. Contracts dictated by the Horoi (boundary stones) were annulled and use of a debtor’s physical body as collateral was prohibited. All citizens who had been enslaved were freed. In the economic arena, Solon encouraged fathers to find professions for their sons. Foreign tradesmen were given incentives to settle in Athens in order to stimulate trade. Cultivation of olives was encouraged, but export of other foodstuffs prohibited. Weights and standards were improved to make Athenian goods more competitive. These reforms pleased no one and everyone causing Solon to characterize himself as “a wolf turning around among many dogs”. His work done, he resigned the Archonship and left Athens for ten years. Unfortunately his reforms were too moderate to create permanent stability and the rivalry continued among the aristocratic families. In 561 B.C, there were three factions competing for control of the Athenian Polis: Hyperakrioi of the city under Pisistratus, the Paraloi of the coastal region under Magacles, and the Pediakoi under Lycurgus from the plains region. That year Pisistratus faked an assassination attempt on himself and seized the Acropolis. The democracy then fell when he took control as a tyrant by out maneuvering his opponents. Pisistratus was banished twice but came back each time and ruled until his death in 527 B.C. He did not change the laws of Solon, but he maintained a private army and had his friends placed in important positions in the government. His income from the silver mines at Mount Laurium were used to benefit the Athenian people by securing the Athenian grain supply, distributing land to the sons of Hektemoroi, and employing the urban poor in building projects. His reign carried on the reforms of Solon and the people became comfortable with a tyrant who brought them stability. Following the death of Pisistratus, his sons Hipparchus and Hippias reigned until Hipparchus was murdered in 514 by a rival faction. Hippias became a paranoid and ruled cruelly until 510 when the Spartans were enlisted to come to Athens and depose him. By 508 B.C, the rivals Isagoras and Cleisthenes were competing for control of the Athenian Polis. Isagoras played the Spartan card one time too many and when the Spartans came to his aid they were repulsed by the angry Athenians. This left the door open for Cleisthenes to push for another set of reforms designed to carry forward the goals of Solon. Cleisthenes innovations were brilliant. He re-organized the Athenian tribes by placing demes from each geographical area (Athens, coast, and plains) in the same tribe breaking up the regional factions that had traditionally been rivals. The chart below shows this tribal organization. 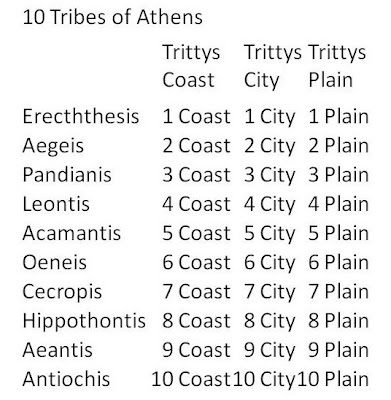 Trittys are groups of three Demes so each tribe consisted of nine Demes. He also took Solon’s council of 400 and made it a council of 500 containing fifty representatives from each of the ten tribes. Members were chosen by lot making it the most democratic body possible. These two great innovations created the political stability that would propel Athens forward for two hundred and fifty years. The new organization was a “democracy” because it gave direct power to the people through the assembly, and that power was greater than that held by the aristocratic families. Some problems with your account. 1. The Hyperakrioi were not associated with the city, but with the hill country in the north-east of Attica (also called Diakria) and the region around Marathon, where Pisistratus had family support. Pisistratus' association with the city took root only after he had taken final control and it is a mistake to conflate his support from the hills with Cleisthenes' later division of Attica containing a city trittys. 2. There were no less than 139 demes in 508/7 when Cleisthenes instituted his reforms, and no more than 140. Also, the demes all had different populations. Therefore, they could not possibly have been divided so evenly among the tribes and trittyes, certainly not by groups of three. 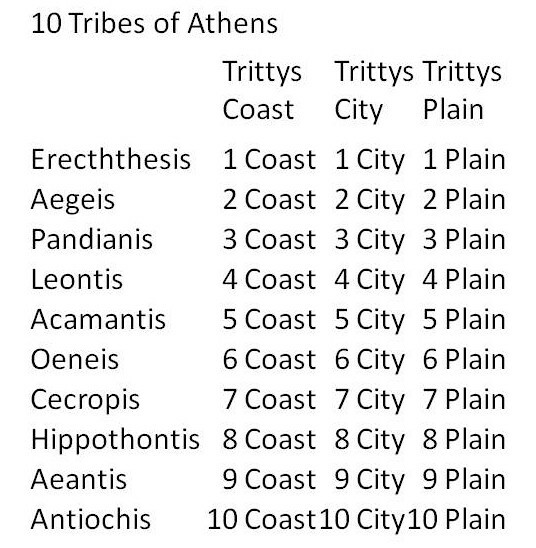 Many sources give differing accounts of this (Herodotus and Strabo most famously), but non can contest the epigraphic record which clearly shows a complex and uneven distribution of the demes between and within the tribes and trittyes. Cleisthenes' was forced to deal with it in this way because of uneven populations between the demes. See John Traill's work "The Political Organization of Attica..." from 1975, and David Whitehead's "The Demes of Attica" from 1986 for the authoritative opinions on this topic.